Learn how to make a recipe for pumpkin cheesecake. Most of us have tried this wonderful tasting squash in pies, cakes (The delicious cake roll!) and all types of desserts so why not in cheese cake. Pumpkins are so popular here in the United States in the fall of the year when the beautiful orange color brightens the landscape. The pumpkin is thought to have gotten its birth in North America although there has been some discussion to the contrary of this fact. Whatever the real truth is about the origination, I for one can certainly tell you how popular they are here. Any good cook will tell of the different recipes which they add the ingredient to and how it adds to the taste and texture. When you learn how to make a recipe for pumpkin cheesecake you will find it is no exception to this rule; the flavor added to cheesecake is so delicious. Spices like cinnamon, nutmeg or allspice added to the pumpkin enhances the great flavor even more no matter what recipe you are making. These spices are also in the apple cinnamon cheesecake and the wonderful peppermint cheesecake. This great flavor combination is traditional at the holidays but believe me, it is delicious any time of the year and we know cheesecake recipes are popular all year long. 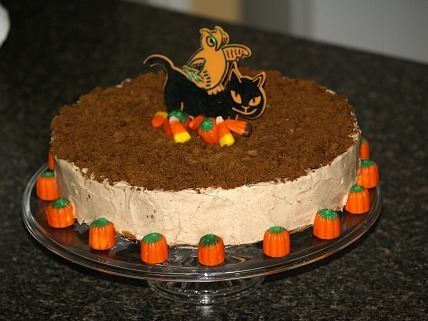 The following recipe for pumpkin cheesecake has the delicious pumpkin spice flavor with the rich cream cheese flavor. This is a great addition to your holiday or Christmas cheesecakes or for those of you who just love pumpkin recipes. Combine the crumbs, almonds, ½ teaspoon ginger, ½ teaspoon cinnamon and melted butter; press in the bottom of a 10 inch spring form pan. Beat the cream cheese until smooth; gradually add the sugar beating until light and fluffy. Blend in the maple syrup, cognac, ginger, cinnamon and nutmeg. Add the cream and the pumpkin and mix well. Pour the filling into the cooled crust and bake for 50 to 60 minutes or until middle is set. Combine and mix; pat in bottom of 9 X 13 inch baking pan. Combine and beat until smooth; pour over crust and bake 15 to 20 minutes until set. Combine pumpkin, 3 beaten egg yolks, brown sugar, vanilla, milk, salt and cinnamon in saucepan. Cook and stir over medium heat until boiling and eggs are cooked. Dissolve gelatin in warm water; add to pumpkin mixture while still warm. Beat egg whites until soft peaks; beat in powdered sugar until stiff. Fold egg whites into pumpkin mixture; pour over baked layers and refrigerate. Cover with layer of Cool Whip to serve. Beat cream cheese, sugar and flour in a large mixing bowl; add spices, peels, vanilla, eggs and pumpkin. Beat mixture on medium speed until blended and smooth’ pour into pastry lined shell. Immediately spread with sour cream topping; cool then refrigerate. Combine and mix together ¾ cup sour cream, 1 tablespoon sugar and ¼ teaspoon vanilla. With no baking, this is an easy recipe for pumpkin cheesecake. Cover graham cracker crust with chopped walnuts Mix cream cheese, cream and sugar in a large bowl until smooth. Gently stir (by hand) in Cool Whip; spread on bottom of crust. Pour cold half and half milk into bowl and add pudding mix. Beat pudding with wire whisk until well blended and mixture thickens. Stir in pumpkin and spices and mix well; spread over cream cheese mixture. Refrigerate this pumpkin cheesecake recipe for at least 3 hours; garnish with additional whipped topping and walnuts to serve. This recipe for pumpkin cheesecake is quickly mixed in the blender. Combine cream cheese and next 9 ingredients in blender container. Blend on high about 2 minutes until smooth stopping 2 times to stir. Pour mixture into prepared pie plate; bake about 45 minutes until firm. Combine and mix topping ingredients; spread carefully over top of cheesecake. Cool to room temperature and then refrigerate at least 3 hours. Try this recipe for pumpkin cheesecake with gingersnap crust. Preheat oven to 325F degrees; grease 9 inch spring form pan. Place pan on 18 inch square double layer heavy duty foil. Securely wrap bottom of pan tightly with the foil; set aside. FOR CRUST combine and blend crumbs, pecans and butter. Press in bottom and 1 inch up sides of prepared pan. Bake crust 9 to 11 minutes until set; cool on wire rack. FOR FILLING beat cream cheese and sugar in a large bowl until smooth. Add vanilla and eggs into mixture beating just until combined; set aside. FOR PUMPKIN MIXTURE place 1 CUP of the filling into a small bowl. Stir pumpkin, cinnamon, nutmeg and sugar into SMALL bowl. REMOVE ¾ CUP of the pumpkin mixture; reserve and set aside. Pour REMAINING pumpkin filling into crust; top with PLAIN filling. Drop RESERVED pumpkin mixture by spoonfuls over top of plain filling. Using a knife make swirls through the cheesecake pumpkin mixtures. Place spring form pan in larger shallow pan; add 1 inch hot water to larger pan. Bake for 50 to 60 minutes until center is just set and top appears dull. Remove spring form pan from water; cool 10 minutes on wire rack. Run knife around edge to loosen; cool another 1 hour; refrigerate overnight. Remove sides of pan; garnish with whipped cream and cookies.